Tonight, my boyfriend surprised me by coming over after my class. We made berry milkshakes, and will be watching movies (I assume). We’re both working on homework at the moment (well, I’m blogging, but you know). But, tonight is not the focus of this post. I promised you that I would post photos today, and though it is nearing 9 pm, those photos will be posted! The Fuzzballs! They still need the ends weaving in, but I’ll get to that soon enough. A closeup of the Fuzzballs. I love how the confetti bits ended up creating vertical lines on one of the socks. The Fuzzballs were another great success. 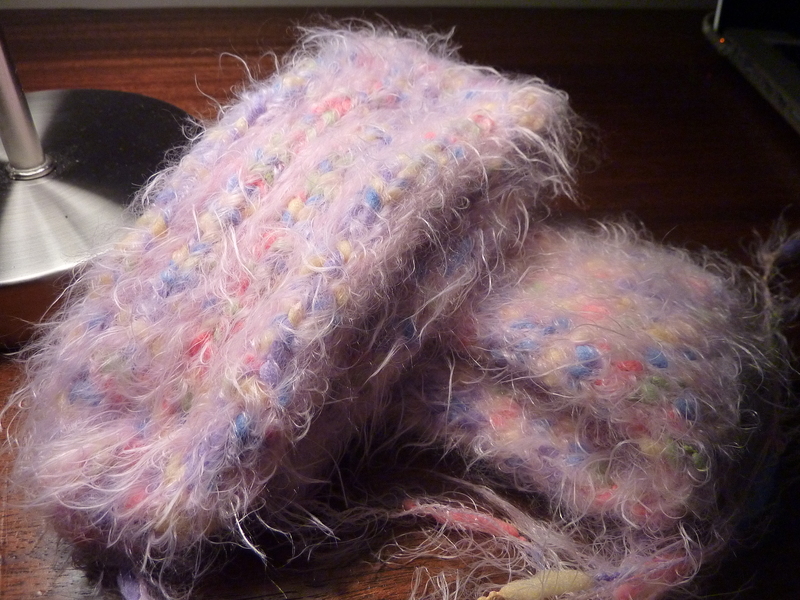 They were super quick, but I’m not sure if I will ever knit with that yarn again. The fuzzy bits are now all over my house and my clothing. (Pattern: my own; Yarn: Paton’s Carmen (Discontinued) in colour #07434 Rose). 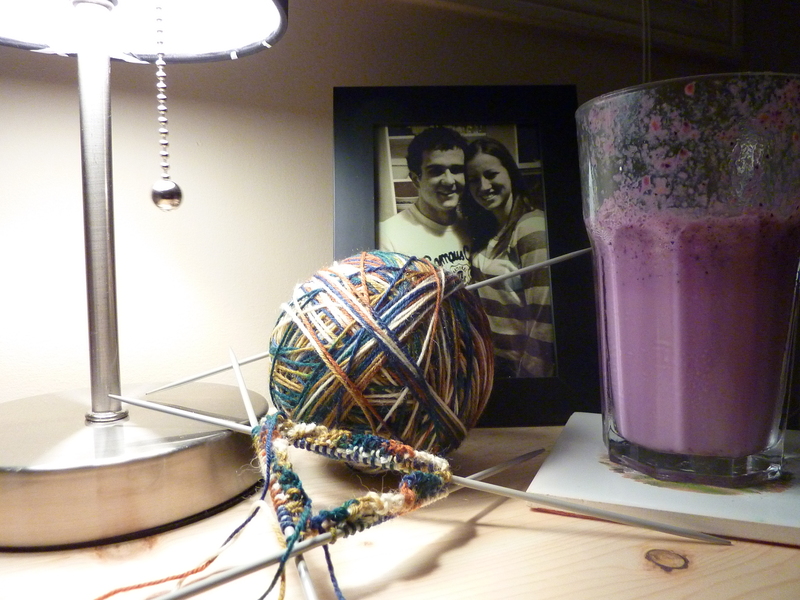 My night tonight – socks, the boyfriend, and milkshakes. My latest project: socks for my dad for Christmas. The pattern is Earl Grey by Stephanie Pearl-McPhee, and the yarn is Nova Value Collection Sock Print in colour #405 Earth Tones. 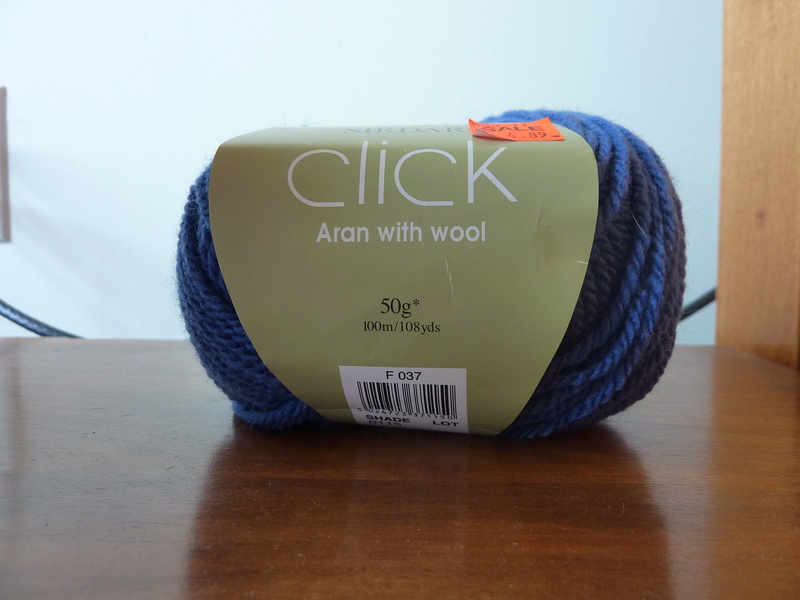 I’ve got my fingers crossed that I’ll have enough yarn… It might be a close one. Now, back to my milkshakes and my movies. I’ll have more progress in the morning. It’s finally fall! 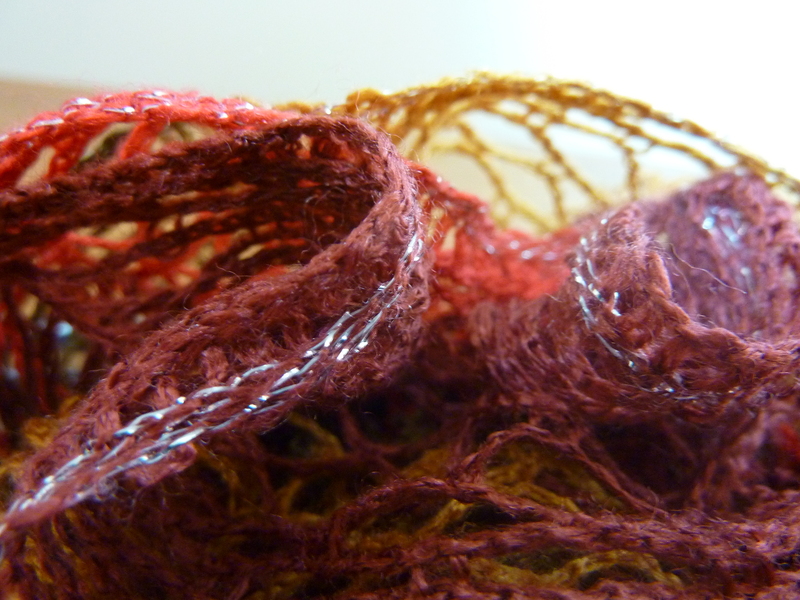 I’ve got a big photo post coming up tomorrow, with lots of photos of the knitting. As I mentioned, the Hat-Heel Socks are officially finished, and now I’m working away on the Fuzzballs… I’ve actually already finished the first sock, in three days! 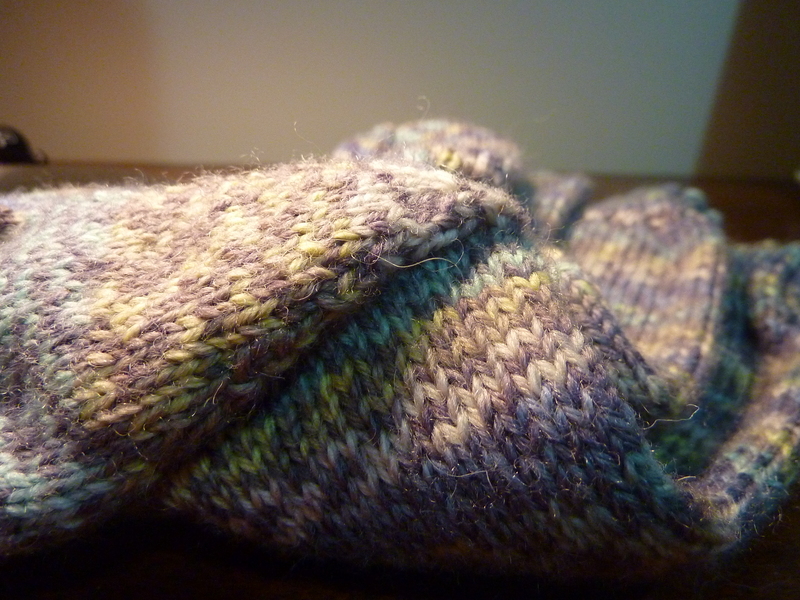 I can stroke another thing off of the 101 things list (finish a sock in a week). I realized that I could have called them confetti for all of the different colours. Today was a chilly but sunny day; typical fall. I came home from school and made applesauce and brownies. Last night I made chicken curry; I’ve become such a cook! It’s strange but also gratifying to cook for myself. I like the independence, and knowing that I can completely take care of myself. My school work seems to be much less than last year… So far anyway. I’ve had lots of downtime to work on the knitting, and I’ve already been scoping out projects for my next pair of Christmas socks. The Christmas knitting is going to be done before I know it! I opened the yarn box for the first time last night since moving back to school, and it was exciting to rediscover what yarn I brought with me. I know that its seems as if I’ve totally forgotten about the sweater. Don’t worry, I’m still committed to it fully, I just haven’t been working on it lately. I like to finish the instant gratification socks first. Soon I’ll be working on the sweater once again. The back is already at 6 inches or more, meaning I have around 11 to go. I can’t believe that it’s already September 24. Soon the snow will be flying (funny, I had a dream about a blizzard last night) and the horses will have their furry winter coats on. I’ll have even more of a reason to be cozying up in handknits! It’s Sunday afternoon and I’m back in the writing game. I hope you all enjoyed my photo-a-day posts… They helped me to accomplish two things on the 101 things list. I’m now at 50/101! The week was busy with homework and studying, but I managed to get some quality knitting time in. Unfortunately, I missed my 1 week deadline with the knitting of the Hat-Heel socks, but I guess that’s something I will manage to finish with another pair. You got to see lots of progress on the Hat-Heel Socks throughout the week, and they are now finished! It’s definitely one of my favourite patterns to date, and it’s on the list of things I’m going to make for myself once all of the Christmas knitting is finally done. This weekend was also Homecoming for my University. I had a ton of fun and got to display some school spirit, which was nice. It seemed as if nothing went right; people were late, parties were shut down, the bars all had hugely long line ups, our pizza delivery took three hours, and we had a forty five minute walk home in the freezing cold… Still, it was definitely a great day! I’m not sure how a day with so many negatives can actually turn out to be the most fun I’ve had all year. Next stop, the Fuzzballs. As you may have noticed, I have shown zero progress towards ripping them back and starting over, but it’s finally done! At last, I’ve restarted these socks, and they haven’t taken long at all, so far. I think they will be a quick knit… But then I’ll have to start yet another pair of the Christmas socks, and I’m definitely at a stand-still on that one. I don’t know what I’m going to want to work on next. I guess you’ll just have to wait and see. Today is a cold and rainy day, in which I have already done a number of things wrong. It was spitting when I left my house, so I didn’t think to put on my rubber boots (aka wellingtons, hence the title). Instead, I wore my moccasins, which are now thoroughly soaked through. I also grabbed one of my rain jackets out of the closet before running out the door, and it didn’t occur to me until I was standing at the bus stop that none of my rain jackets have hoods. Who makes a rain jacket without a hood? Of course, it started to pour as I walked to the bus stop. In other news, I love my Mondays, Wednesdays, and Fridays. I have the best classes. But I digress. The entire point of this post was to talk about the Fuzzballs. They have taken a bit of a back seat lately, and it’s not because I don’t love them (though I can’t post a photo, since I’m at the library at the moment). 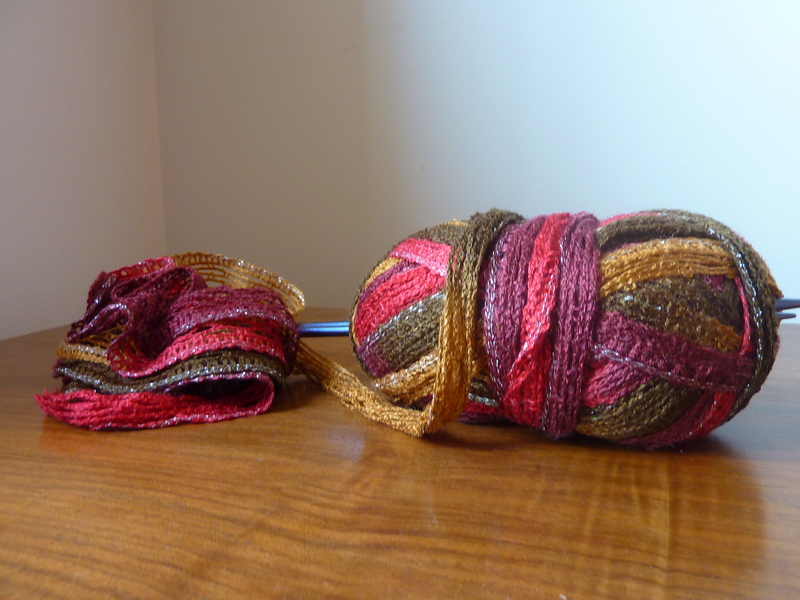 I’m merely just concerned about the amount of yarn I have left versus the length that they need to be. My brain is convinced that if I don’t work on them, the amount of yarn will increase. It’s magic. So, last night, after a few too many beers and a lot of dancing at the local country bar, an idea came to me. I’ve actually been thinking about it for a while, but hadn’t come to a concrete decision. I’m going to be frogging them. I’ll rip them back, then start over with larger needles. This means I’ll have to do gauge again, which is unfortunate, but it’s worth it. 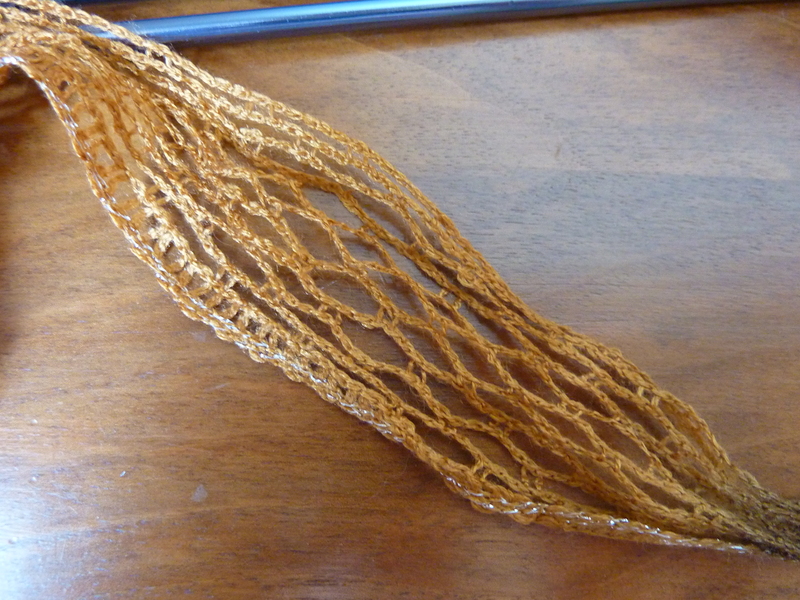 The knitted fabric is also a little too dense for what I was envisioning anyway, so it will work out perfectly. I don’t know why I had to be intoxicated to come to a decision about this, but I did. My only worry is that the yarn won’t frog well, since it has a lot of fibres/fuzzies coming off of it that tend to stick to one another. If worst comes to worst and I can’t frog it, those socks are going to turn into something else. I couldn’t decide which project to work on. Clearly, this demonstrates the fact that I have way too many projects on the needles. I sat last night, and considered each of my four projects, and simply couldn’t choose which one I should work on. 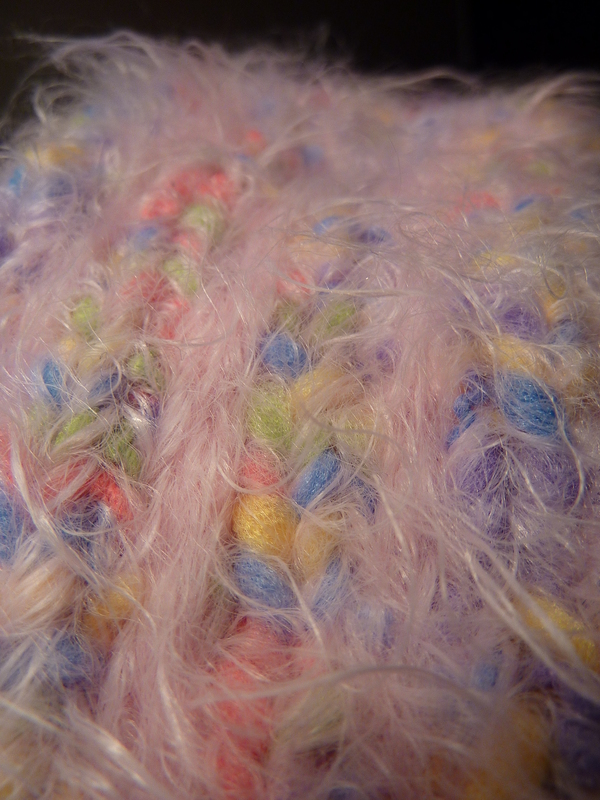 The Fuzzballs are simple stockinette, boring but also annoying due to all of the fibres. I find that they tend to shed all over my clothing as well, and I was still wearing my work clothes. 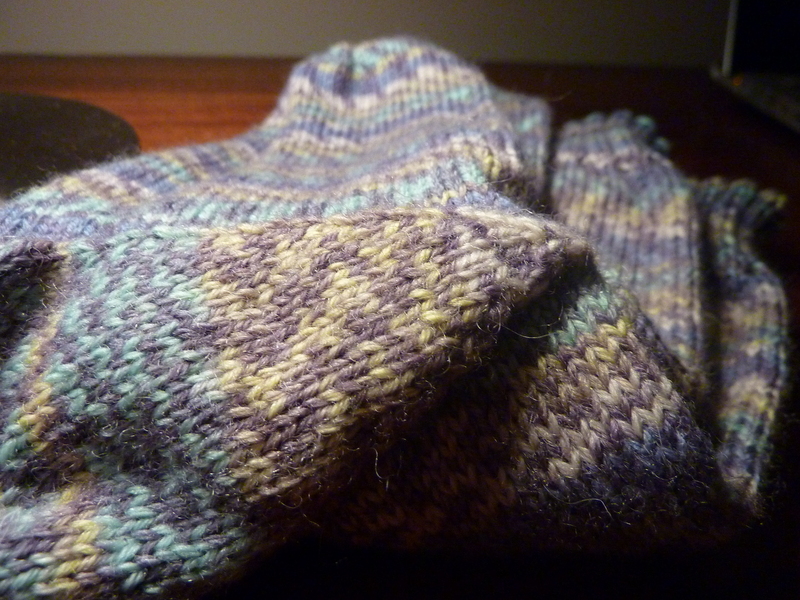 The Hat Heel Socks are also boring old stockinette. I haven’t measured the recipient’s foot, so I’m not sure how much longer I need to make them. The scarf is totally addicting, but not so good to work on while you’re trying to do other things. It knits up quickly and is close to being done, but the concentration aspect of it doesn’t make it good for knitting in the dark. The sweater is now 6 rows in, but each row seems to take so long to finish! Having 87 stitches in a row may not be a struggle for some, but when you’re used to doing simple old socks, it’s a bigger deal. Also, knit one purl one involves some iota of concentration, so I can’t carry on a conversation and continue knitting without looking down. I finally decided to knit on the scarf for an hour and the sweater for an hour. I just can’t believe that I had to decide! What is this blurry mess? However, when you’re late for work it’s not hard to choose; grab the first thing you see. This mess of colour is in my bag, ready for break. It’s my third last day of work, and one of my last chances to knit on break. 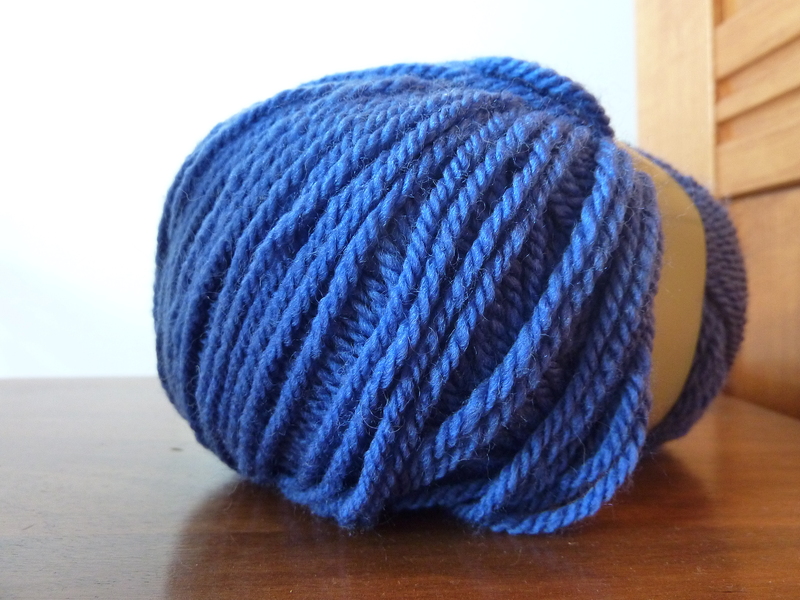 Who knows… Maybe this will mean that a finished object post is on the way! That’s right, tomorrow I’ll be leaving on a jet plane for my family’s annual vacation in Florida with all of my cousins and uncles, and I couldn’t be more excited. This vacation is much needed right now. I’m looking forward to relaxing on the beach with a good book. Part of this yearly trip also results in pre-vacation stress. Last year, I remember sobbing in my room before my trip as I packed, still upset over my breakup with my then-boyfriend, while texting multiple friends who were all telling me to just get over it. I think I was still throwing things in suitcases at midnight. We left the next morning at 3:30 am. But you know what? When I came back I was okay. This year, I haven’t packed one thing yet. I know what I have to bring (I’ve been doing this since I was 6 months old) but I haven’t got it together yet. I feel like I have fifty million things to do before we go… I’ve got to finish this shift at work, go home, have a riding lesson (unlikely, since its pouring) then put the horses out and clean their stalls for the second time today. Then it’s getting ready: painting the toes, setting out my clothing for tomorrow morning, and packing. My best friend is coming over for a few hours, then I’m going out to dinner. Then it’s home again to do chores and make sure the barn is clean, then finish packing and finally bedtime. That list just makes me exhausted. I’ll be on a plane tomorrow at this time, reading in the air and barely containing my excitement to reach my second home, the one of palm trees and white sand beaches. The only thing that bothers me about leaving this year is the lack of knitting. I’ve really become quite attached to it since my long hiatus during school, and I’m just starting these exciting new projects. I really don’t want to leave it behind. 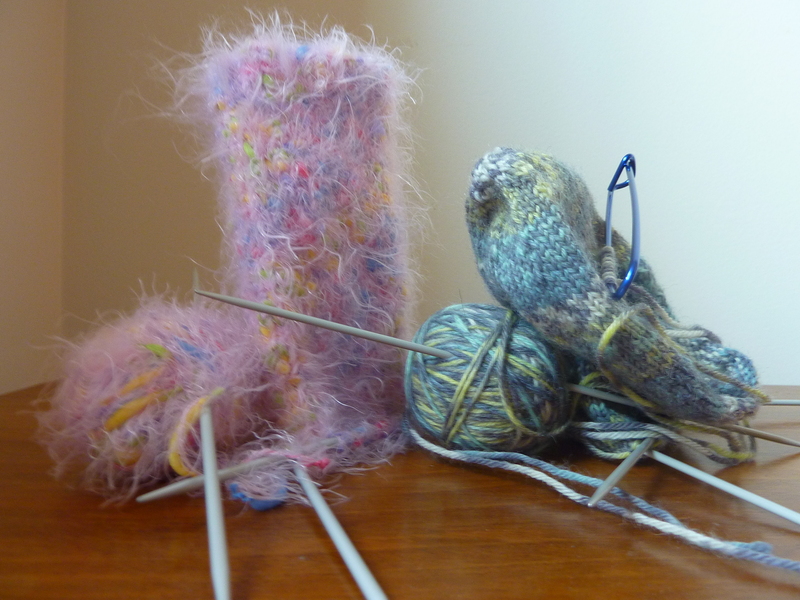 But, alas, I’m no Yarn Harlot, who regularly brings her knitting on the plane… And lives to blog about it. Regardless, it’s a long drive to the airport, so I think I’m going to stuff the Fuzzballs into the vehicle and leave them there while we’re away. Then, when I come back, I’ll have something to do on the drive home. 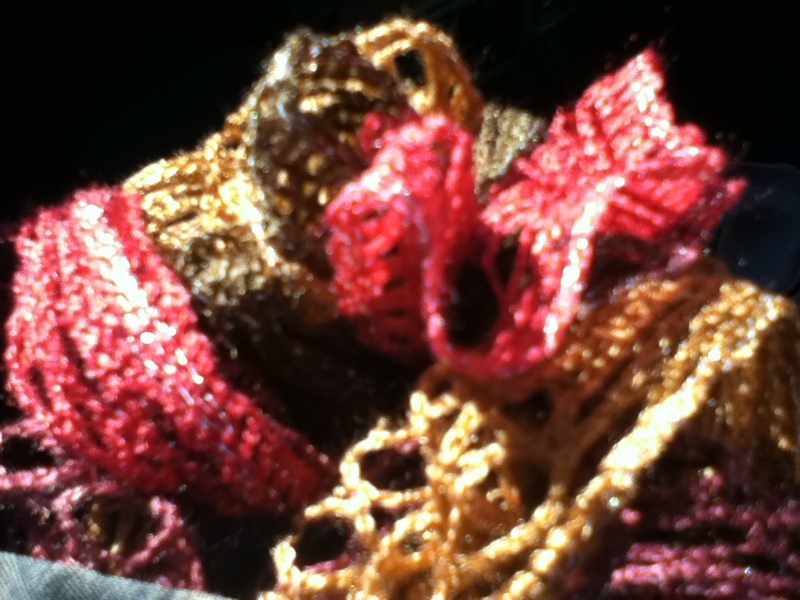 I just can’t imagine sitting in the car for 2.5 hours without anything to knit. We’ll be home during rush hour too, so I think that the knitting is definitely going to be necessary. Until I’m gone, I’ll be planning my first sweater escapade. I’m nearly paralyzed with fear about starting something that big; I’m sure it will take me months to finish. None the less, I’m searching for patterns until my shift is done and I’m free to prepare for the beach life. I’ll be back in a week, with a photo heavy blog post and a nice tan (unlikely, but a girl can dream)! PS. Just thought I would mention that I’ve written this post to the soundtrack of a leaking ceiling in the library… Guess the rain has finally come!